Jermaine Cooper was thinking outside the bun. That's the only way to explain his actions during a chase with Fort Wayne, Indiana, police earlier this month. The chase started when police came to arrest Jermaine on four counts of dealing cocaine. Apparently feeling that the evidence against him was pretty strong, Jermaine attempted to flee. He hopped in his car and led police on a high-speed chase that ended, to say the least, in an unexpected way. Jermaine suddenly pulled into a Taco Bell, where the police arrested him. 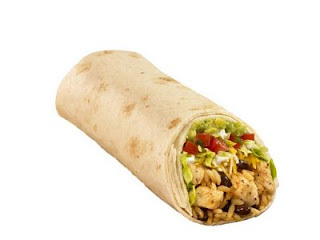 Trying to explain his actions as the cops snapped the cuffs on, Jermaine said he “knew he was going to jail for a while” and just wanted one last burrito. Sadly, the police didn't feel a lot of sympathy for him; they put him in the car without his burrito. If he was lucky, though, maybe it was Mexican food night at the county lock-up. You might rightly wonder about some of Jermaine's choices in this whole series of events. Clearly, he didn't make the best of decisions. And you might wonder about a person who's only thinking of burritos with jail looming ahead of him. But you have to say this about Jermaine: he understood his situation. He knew that his days as a free man were rapidly coming to a close, and he knew he didn't have much time to do the things that he'd left undone. Understanding his situation brought clarity to his last few moments of freedom. Would that we all had such clarity. It's part of being human, I suppose, that we tend to assume that we'll always have time to do the things that really matter. That's necessary, to an extent: who wants a countdown clock in his brain, relentlessly ticking off the days, minutes, and seconds left to him? It would be pretty hard to live that way, I think, always knowing exactly how close you were to the end of your life. The problem, though, is that when human beings assume we'll always have the time to do the things that really matter we almost always put those things off until “after.” After we get through this really busy time, or after the school year ends, or after this next project gets finished. We promise to spend time with our kids after we get that promotion at work and don't have to travel as much. We resolve we'll volunteer at that food pantry or nursing home after retirement. We assure ourselves that we'll be more available to our church families next year, or that we'll be more generous toward the poor once a little more of the mortgage is paid off. But, of course, “after” doesn't always come, does it? Something else will always come along to gobble up that time or energy or money you were just sure you would have “after”, whether it's another demand at work or another expense or even an illness. “After” doesn't come, and those things that really matter, those things that you always thought you'd have time to do, wind up undone. “You sweep people away in the sleep of death,” says the psalmist, and we want to stop listening. All that talk of being swept away? “The sleep of death?” That's just downright depressing. And if we do struggle through it, we're not exactly rewarded for our persistence, are we? He goes on to say that people are like new grass – vibrant and healthy in the morning, and dry and withered in the space of a day. Wow, psalmist. Thanks for that. It's not so much the actual number of the days, of course, as it is the fact that our days are numbered. Wisdom is, in part, knowing what matters: on what to spend the bulk of our time, energy, and resources. And there's nothing like knowing that we only have so much time to make us park our high-speed lifestyles in favor of the things that really matter to our God, and will ultimately really matter to us. You know what those things are, right? You don't need me to point out that what's important to God are things like the people whom we are to love and from whom we are to receive love. If we spend the time we have on people – loving them, caring for them, forgiving them, laughing with them, and crying with them – we can hardly go wrong. If we spend the time we have on noticing those who are overlooked and remembering those who are forgotten, then, well, it will be time well spent. Of course, it's difficult to give that love if we aren't in touch with our God, who is love and who gives love generously and faithfully. So as we love our neighbor as ourselves, we can't forget to love our God with everything we are and all we have. We'll have to seek him, and sometimes we'll have trouble finding him. (Not because he's hiding, but because our vision isn't always clear.) We won't get too far off-track, though, if we spend our time worshipping and thanking him, crying out to him when we're in pain or in need, and trying to do everything we do for his glory. I don't mean to make it sound too simple. I know it's never easy or simple to set priorities, and I know that sometimes we have to be flexible with our to-do lists. But what I'm talking about here has less to do with to-do lists than with what really matters to us. It's the answer to one question: if you had twenty-four hours of this life left, how would you spend that time? If you can live the rest of your life – however long the Lord gives you – with that kind of clarity, you will almost certainly have spent your life well. Here's a hint, though: it's almost a sure bet that it has nothing to do with burritos.